We LOVE New Orleans and know you will too. Walk out the front door and walk to Audubon Park, the Mississippi River, Whole Foods, Magazine Street shopping, and several local coffee shops, restaurants and groceries. Several Mardi Gras parades roll within walking distance (Krewe of Thoth lines up in front of the house! ), and the French Quarter and Mid City and Esplanade Avenue are all a short Uber or streetcar ride away. It is 1.5 miles to Tulane University, 5 miles to the French Quarter/Warehouse District and 7 miles to City Park/Voodoo Fest. Experience the best of the city from this safe neighborhood. Bring your bike and hop on the river levee path less than a mile away for a 20+ mile bike ride along the Mississippi River. 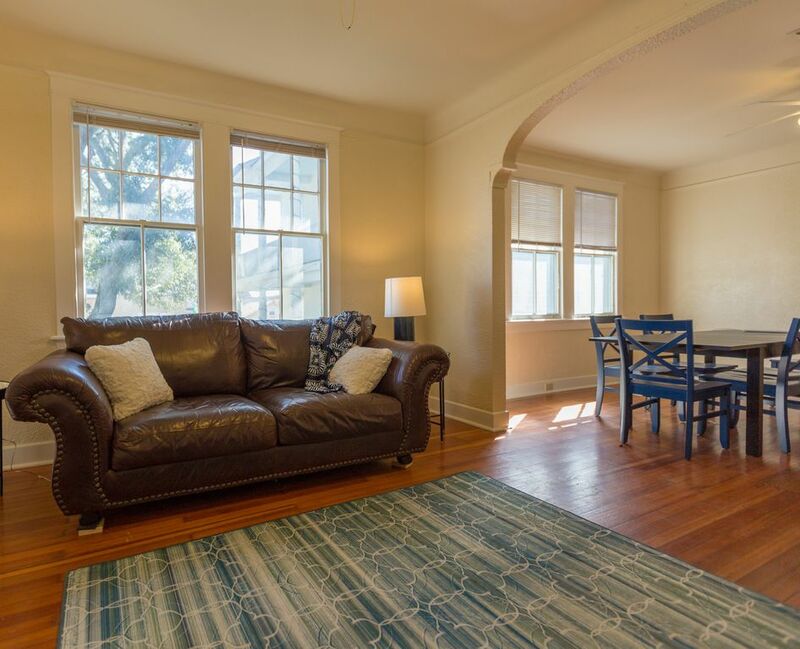 This lovely 3 bedroom home has classic New Orleans charm, including original hardwood floors, tall ceilings, beautiful original windows, plaster walls and other original architectural details. Furnished with a mix of antiques and new pieces and art and photography from local artists, you'll love the New Orleans feel of this bright, light home. The home is furnished with three new memory foam mattresses and new pillows - sleep so well you'll never want to leave! New linens and towels wrap you in coziness for your stay. We want our guests to be very comfortable in our home. We stock the bathroom with body wash, shampoo and conditioner for your convenience, as well as a hairdryer. The two smart TV's and high-speed internet will satisfy your tech needs. There are ample outlets for laptops, phones and other gadgets. The kitchen is fully furnished. We provide plates/bowls/glasses/cutlery as well as pots and pans and utensils for cooking. The home comes furnished with coffee pot, toaster and local coffee with creamer and sugar. There is a full size range/oven and full size stackable washer and dryer. We welcome well-behaved pets and children, but be aware that the house is not child-proofed. There are no cabinet locks, for example. There is no yard, so please pick up after your pets when you walk them. Please do not plan wild parties at the house. We live on the other side of this double - we understand a moderate amount of noise, of course, but not big gatherings. Treat our home as you would your own please. If you need help or guidance around the city, we'd be happy to chat when you're here, but we will not interfere with your privacy. We love this home and can't wait to host you! Message us for prompt responses to questions. Note that we do have the option of renting out BOTH sides of this home, so if you need more than 3 bedrooms, message us about that option. Each side of the double has three bedrooms so we can rent all 6 bedrooms and move downstairs if necessary. Our home is designed to do that. I was born and raised in Jackson, MS, and left for New Orleans to attend Tulane University. I've been here ever since, except for a 9-year Katrina-induced move to the MS Gulf Coast. I now work as an accountant with offices in Gulfport, MS and New Orleans. I have a blended family of four kids with my husband of 2 years and we have two dogs. We love the culture and laid-back vibe of New Orleans, but our long term goal is so sail away and explore the world. Location and historic charm are what led me to this home. I have wanted to live in this neighborhood since I graduated Tulane. So many wonderful things are walkable from here! I love a walkable neighborhood! The architecture of the surrounding neighborhoods is fantastic. I am amazed that I get to live here. My favorite things about this home are the arched glass above the front door, echoed by the arch between living and dining rooms. Also the hardwood floors and the little nook in the hall for a telephone, just like my grandmother's home used to have. The best part is the location, though, hands down. Awesome stay, beautiful home with all the amenities! We had such a great time in New Orleans the past 4 nights. The home was amazing and had such character!! Had everything we could possibly need. Towels were so big and soft and enjoyed the coffee. The only thing I lay add would be full length mirrors in all.of the bedrooms. With 1 bathroom getting ready was a little challange but we managed. We used Uber alot and worked out great!! We hope to be back and would love to use the same house! Wonderful house in walking distance to parks, shopping and food. Clean Comfortable beds. Lush towels and bath mats. Simple decor. Met our needs for our short stay. Attentive host. This is a lovely home. Well stocked with all the comforts of home. It was easy to get around to everywhere we wanted to do while using the house as our "home base". I've stayed at a handful of VRBO's in NOLA and this one is by far the best. The home is spacious, clean, and well equipped. There were plenty of towels, shower had good pressure and plenty of hot water, the sheets were soft, and the beds were comfortable. There are games and activities in case of a rainy day, and a netflix account is hooked up to the TV in the living room and back bedroom. Check in/out was super simple. The neighbors were friendly and the area feels safe. We appreciated the park w/playground just around the corner that was perfect for our kids to burn some energy at in between activities. What a lovely review. Thank you so much. We strive to have a clean comfortable home you can use as a jumping off point to enjoy our beautiful city. We are so glad you enjoyed it. Please do come again. The property was very well equipped and was perfect for our long weekend getaway. The house was larger than anticipated and parking was easy on the side street. We never even moved our car and walked or took Uber everywhere. Would definitely stay again in the future!